"Grateful Pale Ale is a perfectly balanced beer that’s very hop forward, but it’s also a bit lighter and easier to drink than traditional pale ales which we think make it an ideal choice for summer,” said Mark Thompson, founder and brewer of Starr Hill. Starr Hill Brewery, Virginia’s largest and most award-winning craft brewery, is kicking off the summer with the introduction of its new summer seasonal beer, Grateful Pale Ale. Grateful is a medium-bodied session pale ale brewed with two-row and caramel malt. The beer is also brewed and dry hopped with a mix of Topaz, Chinook, Cascade and Centennial hops which produces a huge citrusy, piney hop aroma and flavor, but the beer is refreshing and easy to drink. Grateful Pale Ale will be available at retail beginning May 1 in six-packs (12-ounce bottles) and kegs (1/6 and ½ barrels). The beer is 4.7 percent alcohol by volume, 26 IBUs and will be priced at parity to other Starr Hill brands. Grateful Pale Ale is currently available in Starr Hill’s summer variety pack (12-pack) called The Life. The Life contains three bottles each of Grateful Pale Ale, Northern Lights India Pale Ale, Starr Pils Lager and The Love (wheat beer). Grateful Pale Ale will be supported with point-of-sale materials, glassware and a new on-premise campaign called “Be Grateful.” As part of the sampling campaign consumers will be prompted to share what they are grateful for. Consumers can submit videos or posts via Starr Hill’s facebook or twitter pages or write in on the Grateful Board during promotions at bars and restaurants. Grateful Pale Ale will be available through July. It will then be replaced by Boxcar Pumpkin Porter, Starr Hill’s fall seasonal beer. At the Great American Beer Festival (GABF) in 2011, Starr Hill was awarded a gold medal in the Vienna lager category for Jomo Lager, a light-bodied amber lager. The company also won silver medals for two of its specialty beers, Monticello Reserve Ale (indigenous beer category) and Smoke Out (smoke beer category). The company has won 17 GABF medals and two World Beer Cup medals since its founding. 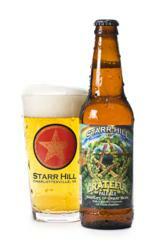 Starr Hill Brewery was founded in 1999 in Charlottesville, Virginia by Mark Thompson and Kristin Dolan. The company brews more than 20 brands of beer representing a variety of beer styles. Starr Hill brands are distributed in Virginia, Washington, DC, Maryland, North Carolina, Pennsylvania, Tennessee, South Carolina, New Jersey and Delaware.